Proving to be a cut above the rest, DC Shoes knows that it takes more than just churning out one product after another to solidify its iconic status as a world-renowned performance skateboarding shoes and action sports lifestyle brand in just over two decades. Apart from constantly impressing the action sports community and beyond with their innovative and tastefully crafted footwear and other lifestyle goods, DC Shoes walks the talk of its “Defy Convention” battle cry as it maintains a tight knit bond with its following through global events and engaging campaigns that not only seek to entertain fans but also to allow them to participate and express themselves. This time around, DC Shoes definitely shook things up as it rolled out a global competition that tapped the unique and creative perspective of its fans. 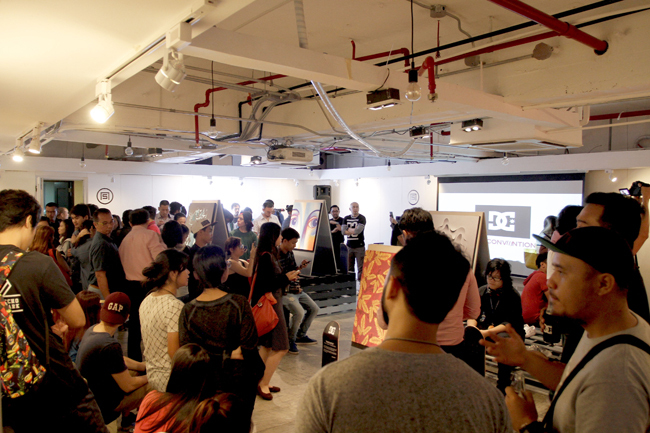 The DC Shoes South East Asia TRASE YOURS Design competition called out to all artists, creators, and designers from each participating country including Indonesia, Singapore, Malaysia, Thailand, and the Philippines to submit their original custom design for the new DC Trase shoes, which features a vulcanized low profile silhouette and clean upper design – making it perfect for applying almost any artwork. The (Philippine) competition culminated in an event held at A Space Makati last July 29 with renowned Wolfgang singer Basti Artadi as host. 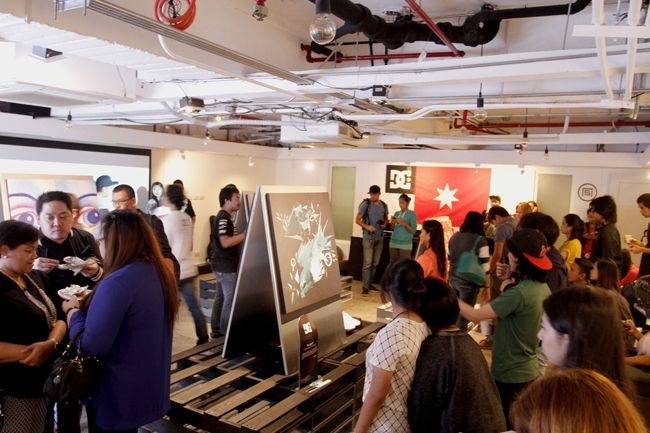 The art works revolved around a lifestyle street culture theme and finalists were selected according to how well their work translated these elements into DC's unique design aesthetic. Judges included: Jowee Alviar, Creative Director and Owner of Team Manila; Marci Reyes of TBWA/SMP Tequilla; Lornel Bihasa, DC Rider and Architecture student from the University of Santo Tomas; and Tracy Montinola, Creative Director for Marketing Services Department, Primer Group of Companies. Out of all the entries, this "bird piece" by Judith Ann S. Talania was chosen for the grand prize. 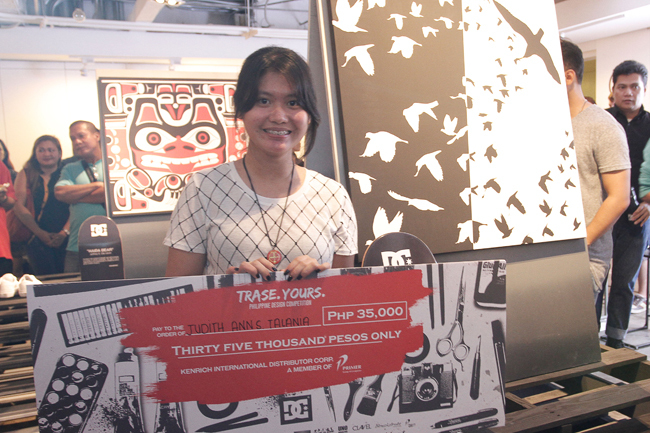 She won P35,000.00 in cash + P35,000.00 in gc's + bragging rights as the first-ever awardee of the DC Shoes design competition. Find DC Shoes at these branches: SM Aura, Shangri-La Plaza East Wing, Centrio Cagayan De Oro, SM Pampanga, Harbor Point Subic, SM Mall Of Asia, SM North Edsa- The Annex, Robinsons Ermita, SM Megamall, Trinoma, Eastwood Citywalk 2, Gateway Mall, Robinsons Galleria, Festival Mall, Nuvali Solenad 2, Abreeza Mall Davao, SM Cebu and Ayala Cebu. 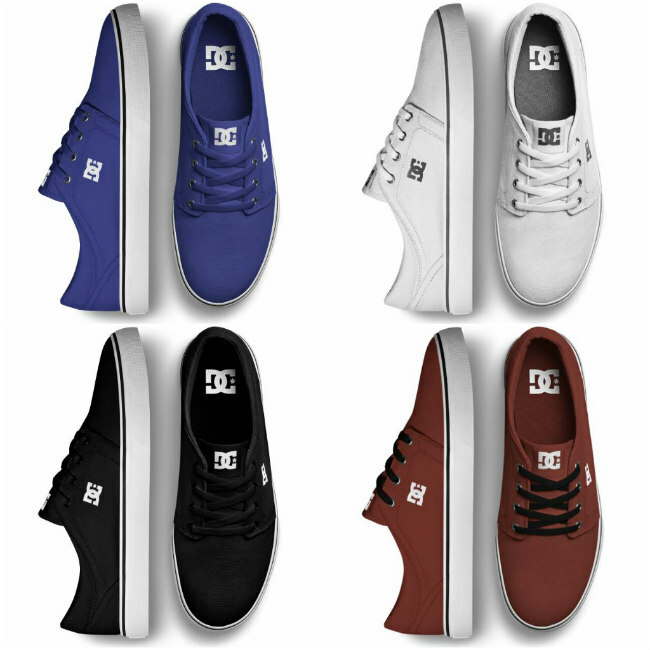 DC is also available at Res|Toe|Run, Bratpack, The Travel Club, Royal Sporting House Robinsons Ermita, R.O.X. Bonifacio High Street and Marquee Mall, Shoe Salon, Toby’s Mall Of Asia and Shangrila, Olympic Village Alabang Town Center, Urban Athletics Greenbelt 3, Duty Free Philippines, NAIA Terminal 3, and Rustan’s Tower. The brand is exclusively distributed by Primer Group of Companies, Asia’s next retail giant, and is a subsidiary brand of Quiksilver Inc.
Ang bongga ng grand prize! She must have been really really good! Wow! Lovin' the winner's entry, its minimal and elegant. My husband loves DC. 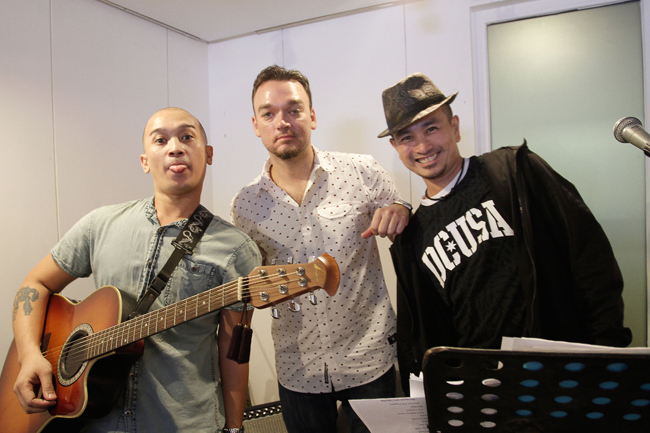 Ooh, Basti Artadi, I'm a big fan since grade school. DC shoes are durable, I have a pair that's almost 4 years old but still look good. 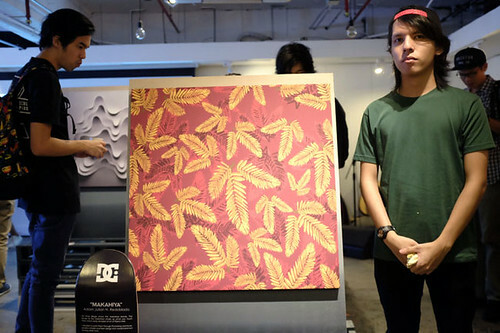 Pinoys are truly creative and for sure those DC shoes would look amazing using the winning designs. My eldest is into shoes these days, I think there's a certain age when you find yourself really longing for different shoe designs. 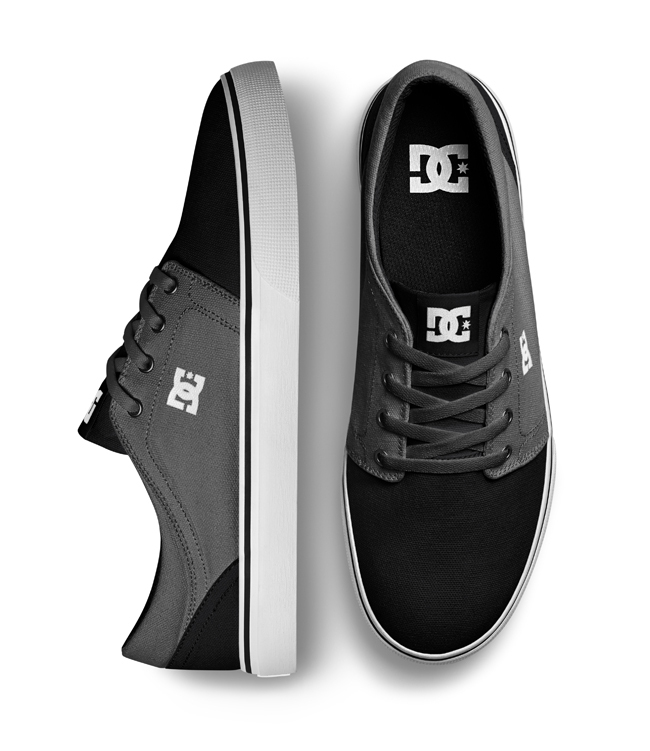 I guess DC shoes look hip and cool. The shoes are something which my daughters would like. The designs are so hip... I won't say hipster because I've been well-taught by my teens that one sign of not being a hipster is when you use the word hipster. hehehe!